Everybody knows that Donald Trump, obstructing justice in plain sight and tweets, tries to get rid of Robert Mueller and the Russia investigation he brought upon himself. Everybody knows that Trump could fire the special counsel, but would then face a backlash tenfold more damaging than the one following James Comey's eviction. He tried to sic his lawyers on Mueller, and to have AG Rod Rosenstein recuse himself, but can't wait to have a friendly, unrecusable, and unbeleaguered successor to Jeff Sessions to stop, torpedo, or at least hack into the investigation. Everybody knows that Trump doesn't want to own Session's departure, and bullies him into resigning. So far, he only succeeded in drawing more support for his AG, even from his fiercest enemies. So here's Trump's latest not-so-subtle attempt: reviving Session's sulfurous past to make him despicable enough to everyone that counts, except of course to their common white supremacist base. 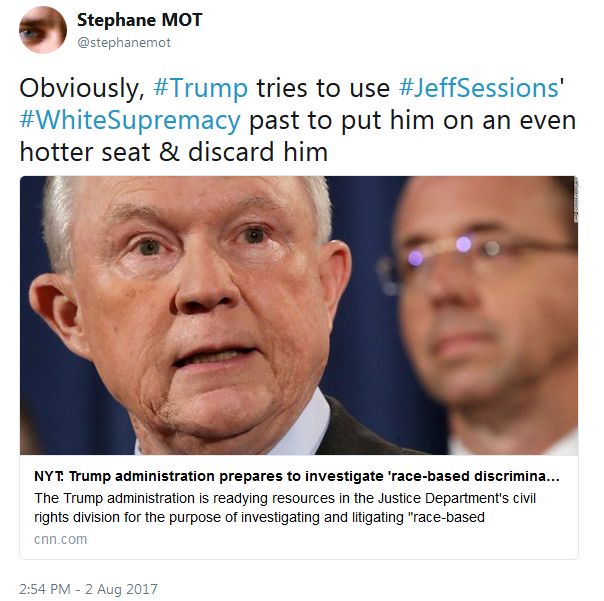 Asking Jeff Sessions to solve racial discrimination is like asking Scott Pruitt to solve climate change - recipe for disaster of biblical proportions (BTW tighten your Bible belt on that one). In the same nauseating breath, and as usual, Trump sparks outrage in a new direction to out-do the outrage surrounding his own persona. Huffington Post's Chris York went as far as to suggest that the Anthony Scaramucci comedia del arte was part of a plot to divert attention from Bill Browder's key testimony*. ICYMI during his hearing at the Senate, Browder exposed the Putin system that killed Sergei Magnitsky, connecting many dots in the Russiagate: Donald Trump Jr, Jared Kushner, and Paul Manafort attended a meeting that not only aimed at helping a foreign power influence the US elections, but also at serving the wealthiest man on Earth, the capo di tutti capi, and ultimate corruptor, Vladimir Putin. Repealing and replacing the Magnitsky act is not about improving adoption, but about saving Putin's business. And we're not talking about superrich emirates bribing their way into the West to gain influence, but about an autocrat determined to destroy Western democracies. Everybody knows that Trump, his family, and friends, are almost openly corrupting the US democracy in ways that reach far beyond money (even if, right on cue, Mueller team announced that Greg Andres, an expert in foreign bribery**, would join the investigation). Everybody knows that the GOP sold its soul to the devil, and can't kick the can down the road endlessly. At least, not all GOP lawmakers remain "Speechless": Jeff Flake delivered a courageous mea culpa for his party's - and his own - shameless denials and betrayals. I must digress here, because Flake waited until after the failed Trumpcare vote to take a stand, and I have to say something about someone who played a pivotal role in this vote. I was sad to learn about John McCain's health, and even sadder to see this old lion disgrace himself once more by voting for the House's s..t of paper (he sank much deeper in 2008 by pledging allegiance to the Discovery Institute, and later by picking Sarah Palin). McCain's (final?) thumb down showed that he cared, and not just about his legacy. McCain also happens to be the strongest voice around against Putin. If the sanctions against Russia put some important issues on paper, they're just indirect measures against enemies of the State Trump and Putin. They cowardly expose how much trust GOP lawmakers have in Trump, who reluctantly signed it while declaring it unconstitutional (ironically, by signing, he was precisely, and for a change, preserving the constitution). Impicitely, the GOP recognized a man who doesn't want the buck to stop here, but in Moscow. These sanctions are a timid start, but America must build a much stronger wall to save itself from Trump and Putin. Indeed, we must build a firewall, or America will pay for it.